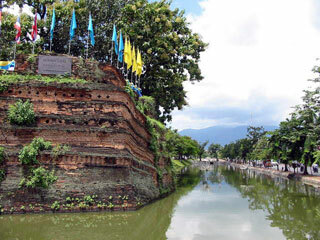 Chiang Mai is the hub of Northern Thailand and the Capital City of the Province of this name. With a population of over 170,000 in the city proper (but more than 1 million in the metropolitan area), it is Thailand's fifth-largest city. Located on a plain at an elevation of 316 m, surrounded by mountains and lush countryside, it is much greener and quieter than the capital, and has a cosmopolitan air and a significant expat population, factors which have led many from Bangkok to settle permanently in this "Rose of the North". This article uses material from the Wikipedia article "Chiang Mai", which is released under the Creative Commons Attribution-Share-Alike 3.0 License.